Donut Quest is a TI-Basic game of revolutionary quality. It uses no libraries of any kind, in fact, you don't need anything other than the game program to play it. On each of eight levels, you must get to (and eat) all the donuts, then leave through an exit (unless given other instructions). Flood the board with a single color in the least amount of moves! Color port of the mobile game Flow Free. A simple "card" game where you flip over two cards each turn to try to get a matching pair. A moderately advanced clone of minesweeper built on the Ti-84 Plus. Play the famous game Minesweeper on your calculator! A mini version of the classic Bomberman game! In Portal, you are a test subject at The Aperture Science Enrichment Program and are testing The recent invention of the Portal Gun! Yay! It allows you to shoot portals and move between them. 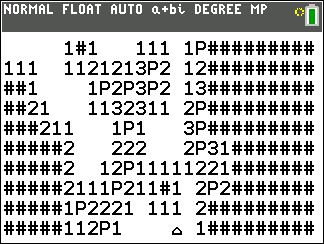 Those who have played the official version will remember GlaDos… And she's back in the calculator version! A great Simon clone! For the Ti 84 +, that can remember up to 99 digits in its sequence! Remember the longest sequence and then repeat it back using the F1, F2, F3, and F4 keys. Good luck! In Six Differences, you attempt to find the six differences in the two pictures displayed side by side on your calculator. Has 9 well designed levels, with a feature to install multiple level packs, AND a custom level editor. Uses a revolutionary system to store levels as a series of lines, which eliminates the need for picture variables, allowing the entire game to be hosted in One Program!